A wonderful large antique opaline glass pawnbrokers advertising pendant. A beautiful & very rare survivor featuring some fantastic workmanship. The hand blown glass shade is deeply etched with the H & T branding & features opaline glass to the front & clear glass to the rear. The huge copper gallery retains its cast iron & ceramic mounting point & is finished with a brass makers plaque. A stunning piece. 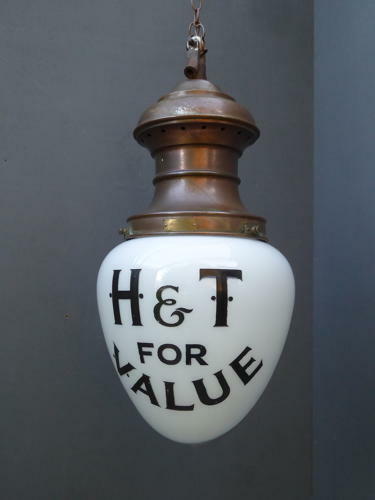 H & T Pawnbrokers were founded in 1897 as Harvey & Thompson & opened its first store at Vauxhall Bridge Road, London. It remains one of the largest & oldest pawnbrokers in the United Kingdom today. ​Wear commensurate with age, very good condition with the usual light nibbles to the rim of the shade. The light has not been rewired & has no fixed bulb holder but can be supplied with a length of twisted black flex & a brass bulb holder. This would be suitable to suspend a bulb for for indoor use, for outdoor use, the light will need rewiring by a qualified electrician. Collection in person advised due to the glass however a UK courier service is available £20 tracked & signed for 24 hour delivery.